Most fine gemstones come from Asia, Africa and South America. North America seems to be barely on the map when it comes to fine gems. But in fact there are some world-class gems produced in North America, including diamonds from Canada, fire opal from Mexico, and gem silica, rhodochrosite and sunstone from the United States. 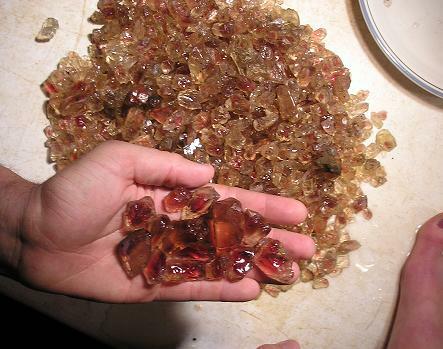 The sunstone from Oregon is generally regarded as the finest in the world, and is still mined commercially (unlike gem silica). Sunstone is a type of labradorite or plagioclase feldspar which occasionally has copper or hematite inclusions. Sunstone is a sodium calcium aluminum silicate by chemical composition with a hardness of 6 to 6.5 on the Mohs scale. Sunstone is found in many places in the world, including Canada, Madagascar, India, Russia, Norway and the USA. 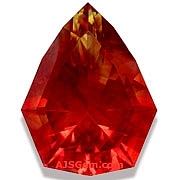 Most sunstone is pale in color and has little value. But the Oregon material occurs in an interesting range of colors, from pink and tan to orange, green and red. The orange and red are the most valuable, especially when the stones exhibit a glitter or schiller caused by fine-grained copper inclusions. This phenomenon is known to gemologists as adventurescence. The Oregon sunstone mines are located in a relatively small area of about 7 sq. miles in the high desert in Lake County in southern Oregon, near the tiny town of Plush. The sunstones formed in a basaltic lava flow at an altitude of around 4,600 ft. Though there indications that Indian tribes passing through the area had collected sunstones, the first documented report dates to 1908, when Maynard Bixby, a mineralogist from Salt Lake City, discovered a new deposit of labradorite in southern Oregon. The Spectrum Mine was the first commercially operated sunstone mine in the state and is still operating today. An outstanding large sunstone from the Spectrum Mine in southern Oregon. Top red color with very good clarity and transparency. We custom cut this fine material to bring out its full fire and luster. This is a unique piece for the serious collector and will make a stunning pendant. Guaranteed natural and untreated. A top grade tsavorite in a rich velvety chrome green. Beautifully fashioned in an elegant pear shape to display full brilliance and fire. 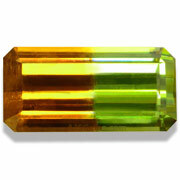 This is very fine crystal (graded "almost loupe clean") and will make a gorgeous ring or pendant. Guaranteed natural and untreated. 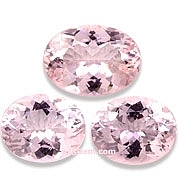 A beautiful 3 piece suite of Brazilian morganite in the rare pink color. The large stone, suitable for a ring or pendant, is 5.45 cts (14.39 x 10.69 x 6.34 mm) while the matching pair has a total weight of 8.35 cts (with each piece measuring 12.34 x 10.12 x 6.20 mm). Guaranteed natural and untreated. A top grade Color Change Diaspore in a large size. 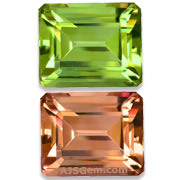 This superb gem has it all -- saturated color, a strong color change and excellent clarity and cut. Diaspore of this quality is very rare over 10 carats. This is an outstanding specimen for the serious collector. Guaranteed natural and untreated. 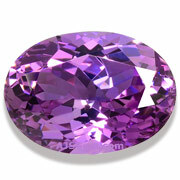 A very rare pinkish purple tanzanite! Clean and well cut, this unusual stone has outstanding saturation and brilliance. Beautifully fashioned in a portuguese cut, this is a wonderful specimen for the tanzanite collector. Guaranteed natural and untreated. Gemfields Plc, the world's largest miner of colored gemstones, is extending their reach to Sri Lanka. 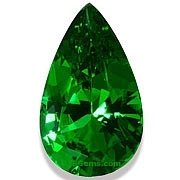 Currently Gemfields mines emeralds in Zambia and rubies in Mozambique. They have recently taken a majority stake in 16 exploration licenses in Sri Lanka and have also formed a gemstone trading company, Ratnapura Lanka Gemstones, to source rough sapphires in the country. The Graff Ruby, currently in the collection of Dimitri Mavrommatis, will be offered for sale at Sotheby's Geneva auction in November. The 8.62 ct pigeon-blood Burma Ruby has an estimated price of $6.8 to $9.0 million. 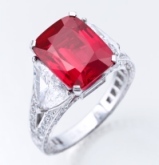 Laurence Graff, the famous London jeweler, originally purchased the ruby at Christie's auction in 2006 for $3.6 million. Jadeite jade comes in a range of colors, including green, lavender, yellow, black and white. The greens range from apple green, leek green and bluish green to emerald green. But the term Imperial Jade is reserved for the translucent emerald green jadeite only, which is especially rare and valuable. Most tanzanite (gem quality zoisite) is heated at low temperature to produce the familiar vivid violet-blue color. But with extensive mining in Tanzania some rare and beautiful colors of natural zoisite have been found and these are now sold as fancy color tanzanite. Colors include green, green-blue, golden, orange, pink and purple. The pinks and purples are the rarest and most valuable, and specimens with a pure and vivid color are especially rare, particularly in sizes over 1 carat.